- 80 gr. dark chocolate chopped in small pcs. Mix the eggs together with sugar and the oil. After that slowly add the flour and mix the ingredients with the help of a mixer. Finally add the apples to the mixure. The final step is to add the baking powder and the chocolate and slowly mix With the help of a spoon. 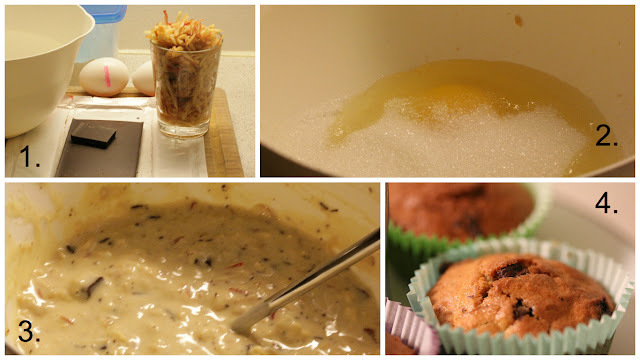 After the mixture is done, put it into the muffin forms, but remember not to fill them to the top. They will expand in the oven. * Bake for 20 min at 180 degrees. Don't forget to share if you like it.